First of all we wish a happy 2011 to all our readers. Second, we compiled a list with our most popular posts in 2010, so that you can re-read your favorite ones and check if you missed any. Next Monday we’ll resume the writing tips, so stay tuned! “There’s” and “There are”: Contractions are supposed to be easy to say. For example, they’re for they are is easy to utter, but adding another re to there to create “there’re” produces a word difficult to pronounce. English words Don’t (usually) End with “u”: The spelling “thru” has an entry in the tolerant Merriam-Webster that jumps to through.The OED has no entry for “thru,” although the spelling is listed along with many other historical variations in the through entry. “Ma’am” and Regional Colonialism; Where I come from, children are taught that responding to grownups with a mere “yes” or “no” is impolite. “Yeah” is unforgivably rude. As a child I was taught to say “yes, sir, no, ma’am” and when I grew up, I continued to say it. When I lived in England, women whom I’d addressed as “ma’am” would sometimes smile and tell me that over there “ma’am” was reserved for the queen. 20 Computer Terms You Should Know: A great deal of jargon is used when talking about computers, and it’s surprising how often these terms are used incorrectly. Even published, successful novels sometimes do so. The following list provides an explanation of some of the more common computing terms you may come across or need to employ in your own writing. 16 Manuscript Format Guidelines: If you submit manuscripts to publishers or agents, you’ve probably come across the demand that you use “standard manuscript format” (or “SMF”) for your submissions. However, it isn’t always spelled out what this actually means. Curbs and Sidewalks: In U.S. English, the word sidewalk refers to a paved footpath alongside a street or a road. The sidewalk is usually raised above the level of the road. The curb is a stone or concrete edging between the road and the sidewalk. 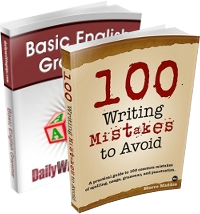 100 Writing Mistakes To Avoid – The Book: One of the fastest ways to improve your writing skills is to free yourself from the most common English mistakes: things like exchanging less with fewer, misspelling its as it’s, or placing commas where they are not supposed to be. Taking and Bringing: Both bring and take have numerous meanings. One can, for example, take medicine, take the Fifth, take a liking to, take it on the chin, take a partner, take in a stray, take up for a friend, take out a date, and take an oath. 40 Twitter Hashtags for Writers: If you use Twitter, you’re probably already familiar with the idea of hashtags. These are simply a way of categorizing particular tweets by including within them a keyword prefixed with the hash or “pound” (#) symbol. PIN Number: To keep your writing as clear and concise as possible, you should generally try to remove unnecessary words. Sometimes duplication is fine – for artistic effect, for example – but as a general rule, it’s best to say things in as few words as possible. Corporate English: Thanks to reader Nick Corcodilos for sharing a link to an especially mind-numbing bit of English prose. I won’t publish the link he sent me, but I will give you an excerpt. Book Titles from Shakespeare: When I was receiving my secondary education in a small Arkansas high school many years ago, every student was expected to study four Shakespeare plays before graduating. The Letter “Z” Will Be Removed from the English Alphabet: Surprising as it sounds, it looks like the English alphabet will be losing one of its letters on June 1st. The announcement came from the English Language Central Commission (ELCC). No Talent for Writing: Unless the questioner wants to become an oral storyteller and tell these great stories to a live audience, or record them as audiobooks, the answer has to be, “Yes, you’re stuck.” However, I suspect that the person asking the question has made some attempt to put stories into writing, but is unhappy with the result. Post, Entry or Article? : My co-blogger and I have come across an interesting usage problem. We don’t know what to call what we write. It feels strange to refer to blog posts as “articles.” “Articles” sounds official, proper and very old media. “Posts” is the more common word, but it demeans the quality of the writing. 20 Movies Based on Shakespeare Plays: For me, April is Shakespeare’s month. I’ll be writing several Shakespeare-related posts this month, starting with Shakespeare in the movies. Story Writing 101: Since prehistoric times, when tales were told around fires and painted on cave walls, stories have been an essential part of our human experience. But what exactly is a story – and how can you write a great one? Don’t Be Burnt By “Inflammable”: In English, the in- prefix is often used to reverse the meaning of an adjective. Thus inactive is the opposite of active and inelegant is the opposite of elegant. So why isn’t inflammable the opposite of flammable? 30 Religious Terms You Should Know: When I was growing up in small town America, stories about religion were generally confined to the Saturday church pages in the local newspaper. Catholics and Jews were the most exotic religious practitioners in town, and “atheist” was a strong term of disapprobation. This post is a beaut! So many great tools, insights and lessons. Great list! I’ll go back and read some the posts I missed. About the “thru”, isn’t it supposed to be through? I mean, it’s because of texting that that word is “created”. Great post! While reading your post, I remember my college days. I took up Bachelor in Journalism in a “not so” prestigious University. Well, those things you’ve mentioned above were the usual lessons that we took up in our Critical Writing subject. I thought writing is much easier than talking. Well, that belief was changed after I enter in college. 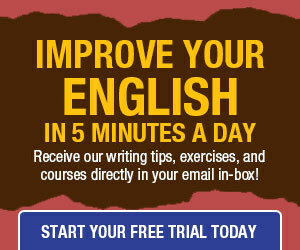 There are a lot of things to consider in writing and that includes the grammar of course. I am not a good writer and is still trying to be a good one. Whenever I write, I committed the usual mistakes in constructing sentences like the use the past and the present tense of the word and when are do we apply or use them in a sentence. That was really funny. I want to go back to my grammar class in elementary. For now, I’m thankful that at least I’ve learned something to correct my mistakes. I read a lot so that I could enhance my vocabulary. Thanks for sharing that post anyway.